This quiz on safe dosages will test your ability to solve dosage and calculation problems for the pediatric patient. These calculation problems are based on the child’s weight and safe dosage range. These safe dosage calculation problems were designed to help you better understand how to apply basic conversions to advanced drug problems. In nursing school, you will be required to learn how to solve these types of problems, along with other drug and dosage calculations. 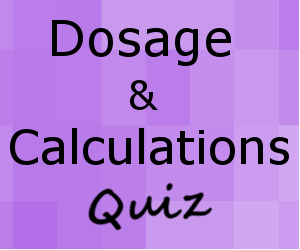 This quiz will test you on how to calculate safe dosage ranges for the pediatric patient. A. No, this is not a safe dose. A safe dose would be 1.02 mg/dose. B. Yes, this is a safe dose. C. No, this is not a safe dose. A safe dose would be 0.5 mg/dose. A. Yes, this is a safe dose. B. No, this is not a safe dose. A safe dose is 310.8-558.2 mg/day. C. No, this is not a safe dose. A safe dose is 327.3-392.7 mg/day. B. No, this is not a safe dose. A safe dose would be 60-100 mg/dose. C. No, this is not a safe dose. A safe dose would be 58.7-176.1 mg/dose. B. No, this is not a safe dose. A safe dose is 0.06-0.09 mg/day. C. No, this is not a safe dose. A safe dose is 1-2 mg/day. 1. Doctor orders Amoxil for a child that weighs 63 lbs. The safe dosage range for this medication is 50 mg/kg/day every 8 hours. What is the safe dose for this child per dose? 2. Doctor orders Zofran 2 mg for a child that weighs 13.6 kg. The safe dosage of this drug is 0.15 mg/kg. Is this a safe dose? 3. Doctor orders Zithromax for a child that weighs 82 lbs. The safe dose range for this medication is 10-12 mg/kg/day. What is the maximum safe daily dose for this child? 4. Doctor orders 300 mg of Zmax once a day for a child that weighs 72 lbs. The safe dose range for this medication is 10-12 mg/kg/day. Is this a safe dose for this patient? 5. Doctor orders an IV drip of Dopamine for a child that weighs 78 lbs. The safe dosage range for this medication is 5-20 mcg/kg/min. What is the safe dosage range for this child? 6. Doctor order Cefazolin 350 mg IV every 4 hours. The child weighs 31 lbs. The safe dosage range for this medication is 25-75 mg/kg/day. Is this a safe dose for this patient? 7. A child weighs 52 lbs. The child has a fever and the doctor orders Tylenol. The safe dose range of this medication is 10-15 mg/kg every 6 hours. What is the maximum safe dose this child can have per day? 8. Doctor orders 200 mg of Ibuprofen every 8 hrs. The child weighs 49 lbs. The safe dosage range for this medication is 5-10 mg/kg/dose. What is the safe dosage range for this particular child? 9. Doctor orders Benadryl for a child that weighs 98 lbs. The safe dose range for Benadryl is 5 mg/kg/day. What is the safe dosage for this child? 10. Doctor orders Digoxin 0.92 mg daily for a child that weighs 16 lbs. The safe dosage for this medication is 8-12 mcg/kg/day. Is this a safe dosage for this child? 2. Yes, this is a safe dose. 4. No, this is not a safe dose. A safe dose is 327.3-392.7 mg/day. 6. No, this is not a safe dose. A safe dose would be 58.7-176.1 mg/dose. 10. No, this is not a safe dose. A safe dose is 0.06-0.09 mg/day.